What with all the clothing brands that have launched bicycles over the past couple of years I figured it was time to try one. And there was one, in particular, that I really, really wanted to try out. Iconic American clothing company Gant have been doing East Coast prep since 1949 and when they decided to launch a bicycle, they did so in style. To roll in harmony with their Rugger clothing line, they chose to launch the Gant Rugger City Bike and went for a walk down memory lane to choose the style and form. The result is a retro dream that looks like almost every gentlemens' bicycle back in the 1920's and 1930's. Just have a look at the bicycles in this newspaper cartoon from Copenhagen, 1938 to see how mainstream this design used to be. In order to get a real sense of the bicycle I did what I like to do. Ride it for a couple of weeks. I quickly dubbed it my café bicycle. 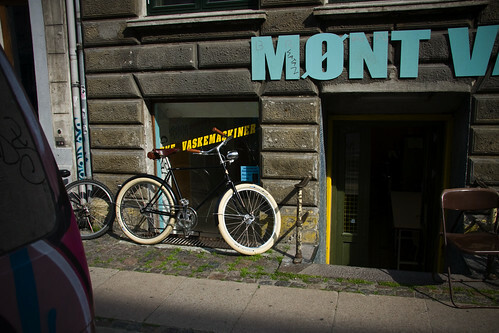 Perfect for summer in Copenhagen and heading off to meetings at Bang & Jensen café or locations in the city centre. I took off the fenders because I like the look of it with those big balloon tires as bookends to the black, mat frame. They'll come on again when autumn arrives. 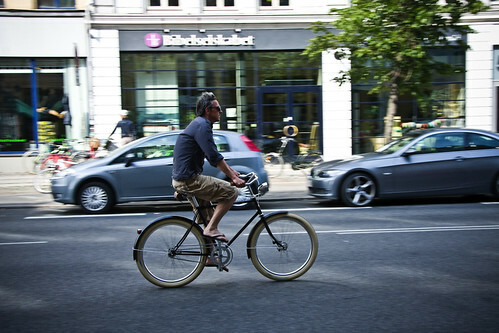 The bike is a real headturner - a Cycle Chic prerequisite of course - and as recently as this morning when heading out of a supermarket a chap nodded approvingly and said, "that's a fine bicycle!". 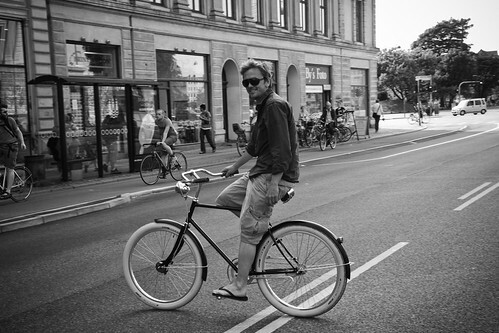 Such is life riding this bike around Copenhagen. People comment on it all over the city. Young hipsters, elderly ladies and everyone inbetween. One fine little detail is that the bike is numbered, like any other piece of artwork. I acquired number 593 out of 648. Sure, number 001 would be cooler, but it's still a cool gimmick having a numbered bicycle. Just parking it on the sidewalk to take photos of it draws glances from people cycling past. Riding it about the city gives me a retro rush. 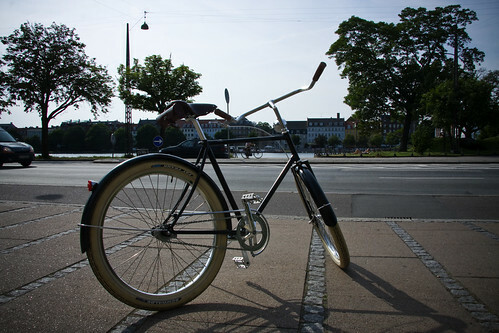 A direct, aesthetic connection to a pre-war Copenhagen when the bicycle reigned supreme. Like in this travelogue from 1937 in Copenhagen. It's a cool, easy ride and the balloon tires are brilliant for city life. It's a one-speed perfectly adjusted for every urban speed. Not too fast, not too slow. Just right. The Gant Rugger is perfect for modern urban living and compliments any shopfront - whether tragically hip or refreshingly rundown. 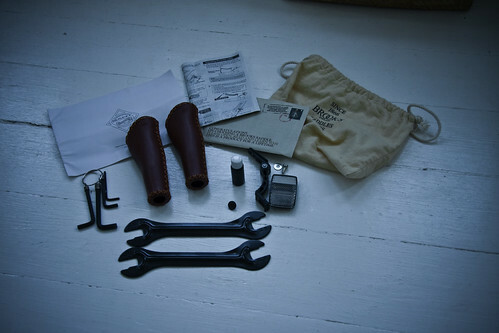 The little bag that accompanies the bicycle contains an extra pair of Brooks handlebar grips should you fancy another style, a bottle of paint for fixing scratches, black tools to match the bicycle, a white reflector ready to mount, care instructions for the Brooks saddle and grips as well as an 'instruction manual' for the bike. 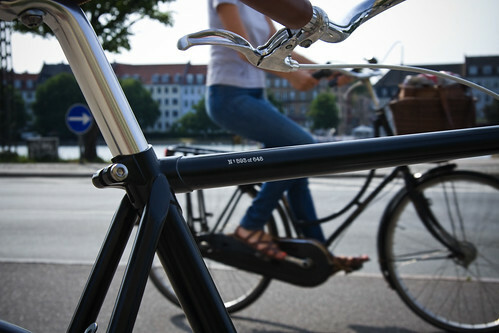 Don't see the latter when you buy a bicycle in Copenhagen so that was... um... interesting. All in all, The Gant Rugger is wicked cool. Here in Denmark they retail for 7000 kroner at the Gant flagship shop on Østergade. That's $1250 USD. Although prices will certainly vary depending on where you buy the machine. "number 593 out of 648"
Very pretty for a common production bike. It is a nice looking Bike,a nice Runaround for the Town ,no complications Clean Lines. It seems to be more low Slung which makes it handy for getting on and off. It could do with at least a Carrier on the back and perhaps a Basket on the Front to carry the Beer. I like the idea of having a Chain Guard to keep your best Trousers clean on a Town Bike which this Bike is missing. In our Country Ireland it helps to be able to get the Tyres off easily in the event of a Puncture because we do not have the Facilities of a Bike Shop at Odd Hours so Clean Lines are important. So easy Maintenance is very important to us especially at Nightime in the City. 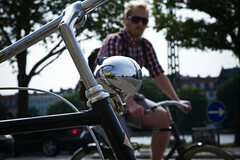 What is the Price of the Bike in Euros Please or indeed UK Pounds to get an Idea of cost. What a lovely bicycle. Quite a catch for such a limited run. Hope you wear the tires out soon. Happy riding! so what does it look like without fenders? elegant, but i think i'd like a Pashley Guv'nor more... or my classic Velorbis Churchill. A RetroVelo Klaus without the characteristic fork crown? I find your supposed review to be too booster-ish of the brand. Your review is far too complimentary to be taken seriously and comes across as being an advertisement for the product. Did you get compensation of any kind for this review? I got free strippers for a week. And a case of beer. Oh, and a used CD of U2's Unforgettable Fire. Your flippant comments aren't an answer. "I have received nothing" is what your readers are looking for - apparently you are not willing to say that. 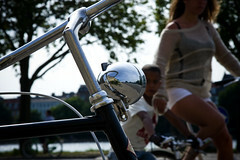 I wonder if they build this bike in the many Gant sweatshops? Made buy people who earn less than a dollar a day. Are you sure Mikael that this was an ethical purchase. I see you like this vacuum cleaner, eh? I don't usually waste time on people who comment as 'Anonymous' but I'll say this to your comment about what "my readers are looking for": please do not make the mistake of assuming that you speak for 4000-5000 daily readers on this site. because you don't. Martin: Methinks that most purchases these days are ethically questionable. But for the record, the bike was designed by a bike company for Gant so it's sure that it was produced like most other bikes in the world. In Taiwan. So whatever happened to your Velorbix(tm)Gran Turismo De Luxe? Martin, it's about as ethical as your computer, which you used to post your comment, containing components from chinese FoxConn where workers routinely committed suicide due to poor conditions. Beautiful bike! It's great to see the classic designs are coming back.